Last Sunday we heard Mark’s account of the Twelve sent out to share in the Saviour’s mission. Today we have the aftermath described in vivid detail. As they rejoin Jesus, they are full of stories as they share the experience of their missionary journeys. We glimpse the openness and hospitality of the band Jesus gathered around him – ‘there were so many people coming and going that the apostles had no time even to eat’. 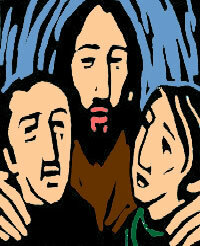 Jesus suggests they cross the water to a ‘lonely place’ where they can ‘rest for a while’. Now he will teach them how to find the interior strength that comes from reflection and contemplation. The scene Mark describes, as Jesus and his disciples arrive at their destination, is a memorable one. The crowd has heard of their coming and awaits them. Hungry for what Jesus has to give them, they ‘were like sheep without a shepherd’. So he changed his plans and ‘set himself to teach them at some length’. During the Easter season we were reminded that the Risen One is ‘the good shepherd’. On Good Shepherd Sunday, however, our image was the familiar iconic figure, bringing back the lost sheep on his shoulders. Today we have a down-to-earth image. People weighed down by life’s daily problems are looking to Jesus to renew the vision of hope he has given them in the past. He changes his plans and responds to their need. He has another important lesson for the Twelve – the love for struggling humanity that he shares with his Father. He knows no limit or holding back. He wants his disciples to be one with him in this love if they are to be companions in his mission. The prophet Jeremiah gives expression to old Israel’s faith and hope, as it looks forward to the ‘virtuous Branch’ of the house of David - the messiah who would bring fulfilment to all Israel’s immense hopes. Jeremiah saw the Babylonians bring ruin to Jerusalem, because the ‘shepherds’ who should have cared for the people were deaf to his message. Now, he declares, God’s people must look forward to the promised messiah, the ‘true and wise king’ who – as his name indicates – will express the Lord’s own ‘integrity’ as he cares for them. In our reading from the letter to the Ephesians, the teaching of Paul again makes a dramatic shift to the time of fulfilment. What the prophet looked forward to, what Jesus promised as he gave hope to the people and instructed his disciples, has been realised in the Paschal Mystery. God’s final achievement, through the power of the Saviour’s resurrection, has many aspects. This passage celebrates the Paschal Mystery as bringing the peace and reconciliation in which the apparently insurmountable barriers that divide the human family are overcome: ‘by the blood of Christ’ those who were estranged and hostile to one another have been brought together. Paul’s teaching is profound. The Saviour ‘in his own person has destroyed the hostility’. In his Paschal Mystery he has identified with struggling humanity that we may be taken into a sharing in his resurrection triumph. God’s project, so long frustrated, has now been gloriously successful, in the ‘New Man’, the ‘Last Adam’ (1 Cor 15:45). Through the Risen Lord, our disrupted human family has ‘in the one Spirit our way to come to the Father’.